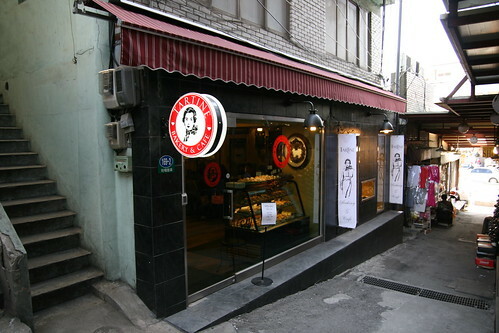 Paul Ajosshi: Romanian Peasant Bread in Seoul? Flipping through the latest issue of PR, I spied an article by Niki DeWitt called "The Sweet Escape". Writing about artisan bread in Seoul, DeWitt focused on Chef Garrett at Tartine in Itaewon and his new addition to the bakery. Not only can you get your share of tarts and cheesecakes, but now you can purchase Chef Garrett's own "Romanian Peasant Bread". For 4,000 won you can buy either a loaf of "Oats Peasant Bread" (a mix of unbleached wheat flour, wholewheat flour, rye flour, rolled oats, yeast, salt and water) or "5 Grain - 3 Seed Peasant Bread" (a mix of unbleached wheat flour, whole wheat flour, rye flour, corn, whole wheat, brown rice, oats, rye, flax seeds, sesame seeds, sunflower seeds, yeast, salt and water). It's good stuff, the name is a little fancy, but it's good quality bread. 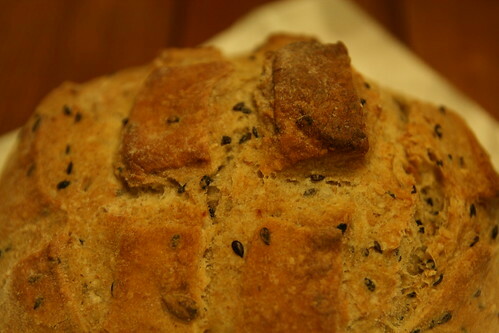 It tastes like it's home baked and it looks as if it has been made with love. I'm not sure how authentic Tartine's Romanian Peasant Bread is, but I am certain I will be buying it again. Tartine is two alleys down from the Hamilton Hotel (take the alley opposite the Three Alleys Pub) and serves wonderful tarts aswell as Romanian Peasant Bread. You can call them on 02 3785-3400 or visit their website here. 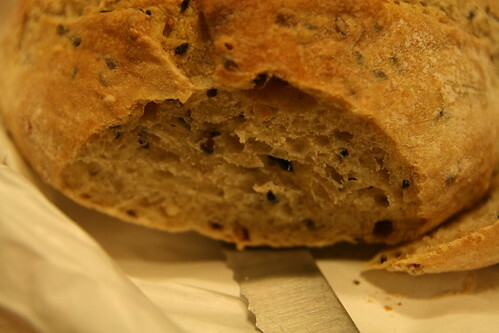 Thank you for your kind words about our Bakery / Café, especially our newest item, Romanian Peasant Bread. You mentioned that you were not sure how authentic our Romanian Peasant Bread is; let me assure you, it is authentic as possible. I visited Hungary, Romania and Austria in 1995 to learn more about farmer’s bread or peasant’s bread. Our bread is made the same way Eastern European peasants baked for over 1000 years. We do use an electric oven however. It is true that I use a 30 year old sourdough starter. I carried the starter with me on board the ship that brought me to Korea; having to ‘feed’ it four times during the 15 day crossing. 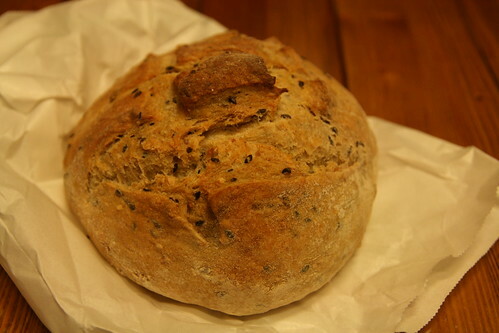 I truly believe that we are the first and at present, the only bakery to offer this type of bread in Korea. We will also have Rhubarb Jam to enjoy with your bread [table service only]. I use a family recipe to make our jam. By Korean Law, we are not allowed to sell our jam retail, yet. Thank you again for your support and patronage. Thanks for your comments. I'll have to pop down to try out your rhubarb jam!